Eliminate cue cards, flash cards, paper notes and scripts forever. 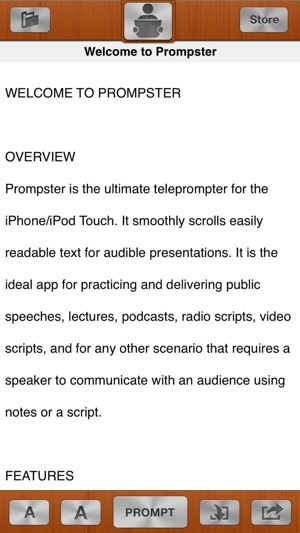 Practice and deliver speeches, lectures and sermons or use for any scenario that requires a speaker to communicate with an audience using notes or a script. 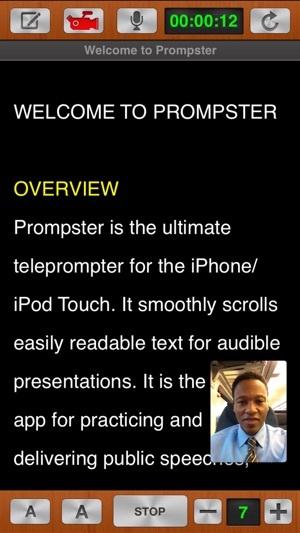 Mount your iPad on the tripod with your camera, tap start, scroll the text and never forget your lines again. 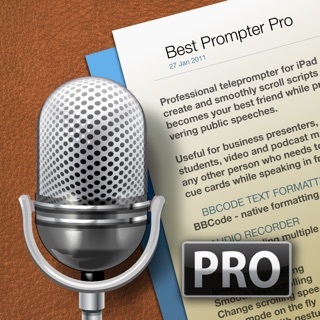 Keep your script at your fingertips to record voice-overs for your PowerPoint or Keynote deck. Stay focused, keep your script at your fingertips and keep track of elapsed time. Turn on this option and for use with your favorite 3rd party display systems. 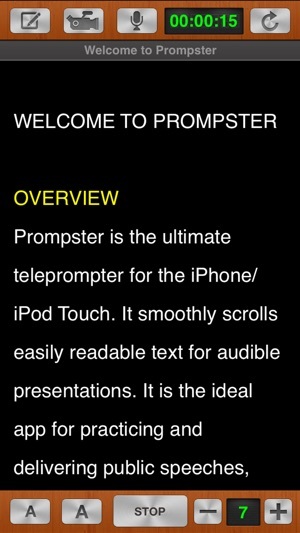 - Mirrored/Reverse Text Option for use with your favorite 3rd party display systems. NOTE: WORKS WITH .TXT FILES ONLY. Please convert your .doc or .pages file to a .txt file before importing. 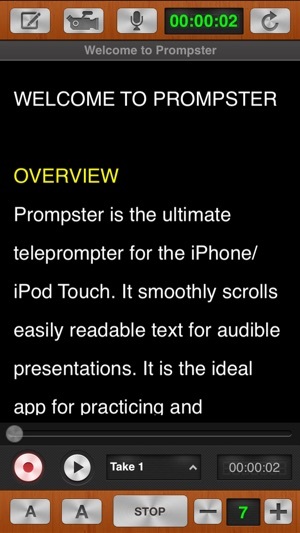 This is version 3.8 of Prompster™. 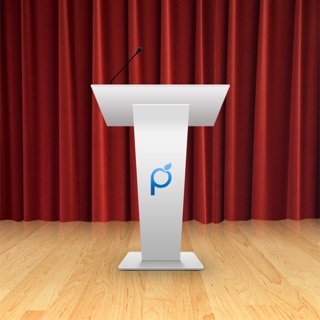 Please provide feedback to help us make it the best public speaking app on the planet. If you would like to suggest a feature we'd love to hear from you! Please note: We respond to all email within 24hrs. If you didn't receive a response please check your bulk e-mail or spam folders. 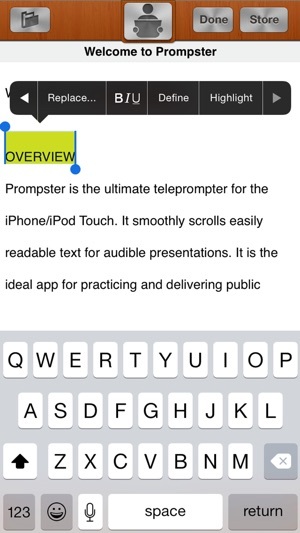 Performance update and bug fix: removed extraneous characters when doing a copy-n-paste of text from other apps into Prompster. Very disappointed, difficult to load. What a waste of money! I could not easily get my content to load. It never loaded after many many attempts. I finally gave up and purchased another app. No refunds are available and so here is my review. If I could give ZERO starts I would. OK guys, I was really enjoying this app I’m not sure what’s up since the new update but it will not open on my iPad or my iPhone. What is the resolution? Appreciate the new features, even the icon looks cool. Just wish this app had a way where instead of having to hit stop each time or fiddling with the speed buttons in order to slow down or speed up the prompt; that the (black) prompt screen could be advanced or frozen by the swipe or touch of a finger, yet done in such a way that would not affect the timer. Another great feature would be an edit on the fly feature, or at least when going back to edit mode, that the screen could leave off more or less where the prompt mode was at, rather than having to stop the prompt, switch back to edit, scroll furiously through the whole presentation to find where the edit needs to be made, then switch back to prompt, wherein the darn thing takes you all the way back to the beginning, and once again you have to scroll furiously to find your spot. This is the worst when it's 5 minutes before show time. Another thing that seems kinda bad: because I tend to carry the iPad in-hand while speaking, sometimes my gestures cause the screen to rotate. Now I lock the screen with the side switch, but should the screen rotate, the action itself takes you to a whole different area of the text while in prompt. One just has to remember to lock.